Combining philosophy with progressive death metal, Vintersong's latest 12-track release challenges the brain in many different ways. For starters, the album's vast musical styles featured on The Focusing Blur showcases an outfit with a versatile knowledge of all things rock, from the progressive metal edge of "The Thesises Seasons" to the orchestral death metal of "Star Puzzled". 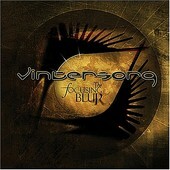 Coupled with the masterful performance by a rhythm section that boasts ex-members of Death and Borknagar, The Focusing Blur is an album which conveys both the band's expert musicianship and intellectual fortitude, as the lyrical content is as intense as the elegant musical backdrop from which its sung. If you dig Opeth, chances are Vintersong's newest release will give you the same chills and thrills. Vinnie Vincent Invasion: "Self Titled" / "All Systems Go" Vinyl: EP (BTB Ehf.